Community professionals should excel at developing homepages for their clients or their own organisations. This is an important task to get right. A homepage should tell members who/what is new and who/what is popular. 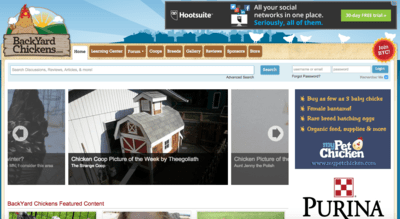 The biggest mistake most community professionals make is to design a content site instead of a community site. When content is given greater priority than activity, you're heading down the wrong track. Form clashes with function here, and function has to win. The homepage should feel like a bustling hub of activity. It should show members activity they want to participate in straight away. There hasn't been much innovation in this sector. Too many are based upon some forum/content hybrid. We're seeing five broad approaches emerge. I suggest you pick one. 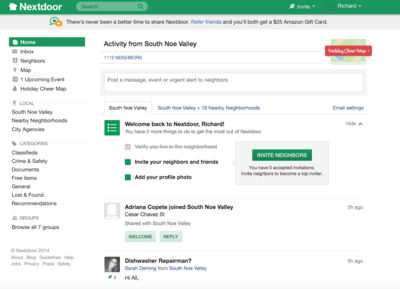 NextDoor is one of the few communities that isn’t based upon a forum structure. Member’s don’t scroll through discussions initiated in a traditional way. They scroll through activity in reverse chronological order. The benefit of embracing Facebook’s wall is members know how to use it. They know that they can post a status update on the top and initiate a discussion. Members don’t have to browse through hundreds of categories – in fact, categories are irrelevant. Members just want to see what’s new in the community. A community that takes a similar approach is FetLife. The site is built on RubyOnRails and activity appears at the top of the page in reverse chronological order. The difference here is FetLife shows the latest activity from friends as opposed to showing you the latest activity from all members of the community. 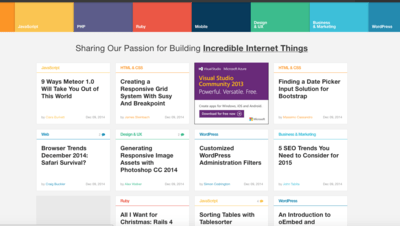 Sitepoint is an example of the growing number of Pinterest-style communities. The homepage appears in a box-structure which allows every member to see a dozen different items of content to view and respond to. It won’t please aesthecists, but it will please visitors. You can instantly see all the latest activity posted in the community. You can also see the comments on each post. The comments are also linked to a Discourse style forum thus when someone replies they can continue the discussion by e-mail. The discourse forums are also based upon simple navigation. The categorization options at the top are also useful for simple navigation. In the future, it might be possible for members to sign up for specific categories and receive updates from each. 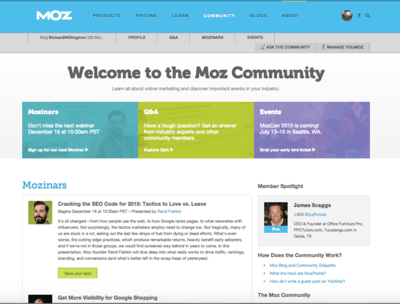 Moz has a slightly more traditional community homepage with an important difference. It nudges you to the type of activity they are trying to solicit. The community is built from live events. These events are webinars and MozCon. Q&A is important too, but it ranks as a second function. Not every community is built around traditional discussion areas. Moz is an excellent example of the alternatives. A community can be built from live webinars (or many other types of activity). Moz discourages random discussion in favour of Q&A support for members. In the Q&A area, Moz has a few clever innovations. These include a search box for new members to find answers to similar questions before asking their own. Better still, they aware more points (bounty points) for questions which are especially difficult to answer. Asking questions is also restricted to existing customers. StackExchanges is the modern, superior, incarnation of communities traditionally based upon online forums. 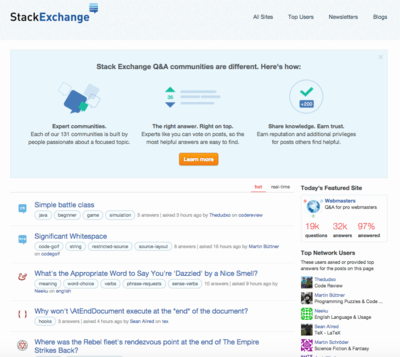 Whereas most forums became bloasted and messy, StackExchange (like some platforms such as Vanilla) is sleek, simple, and drives people solely to seeing the latest activity. StackExchange has the purist approach to community of the five communities we see here. Any content-related activity is relegated to secondary pages in favour of discussions. If you're solely looking for activity, this is the approach to take. 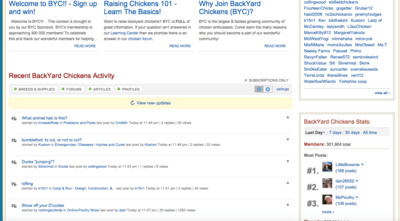 5) BackYard Chickens – Show the discussions on the landing page of the community. Backyard Chickens isn't an attractive community. The genius in the site is combining content created by the host/volunteers with content created by the community in the top, slider, bar. Specific discussions are as likely to receive content-level placing as volunteer content. The discussions are placed at the bottom of the page, similar to many Jive communities. In fact, you could add the discussions from the community to the bottom of every single homepage of any organisation's site to boost the level of activity. If you're struggling to balance the content/community needs, combine the two at the top and add the discussions at the bottom. Most community professionals are familiar with one or two approaches. Far better to be equipped with all five.